What If the Mandate Goes? 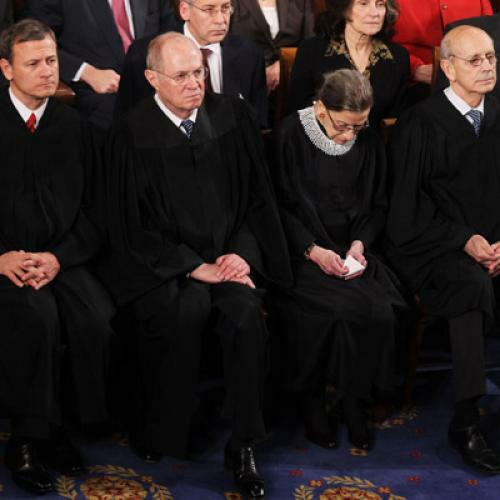 Everybody is down on Solicitor General Don Verrilli, who presented the government’s case for the Affordable Care Act at the Supreme Court last week. And everybody is up on attorney former Solicitor General Paul Clement, who argued on behalf of the states challenging the law. But the attorney who impressed me last week was one that almost nobody seems to have noticed: H. Bartow Farr. Who is Farr? He is a private attorney who appeared before the Court for 30 minutes on Wednesday, during arguments over “severability.” During that hearing, the Supreme Court considered the critical “what if” question: What if we strike down the mandate, as the challengers are urging? Should we throw out the rest of the law, or just part of it? And, if just part, which part? The challengers, represented by Clement, want the Court to toss out the entire statute. That would mean, first and foremost, junking the expansion of Medicaid that will reach about 16 million people and all of the payment reforms in Medicare that, by many accounts, are already starting to push the health care system in the direction of more efficiency. It would also mean eliminating better drug coverage for senior citizens, myriad anti-fraud and abuse efforts, rules requiring drug and device makers to disclose gifts to providers, and guarantees of free preventative care, among other things. As Justice Stephen Breyer noted on more than one occasion, even seemingly peripheral features, like investment in the Indian Health Service, would disappear under such a sweeping and radical ruling. The government wants to spare most of those provisions, particularly the Medicaid expansion, even if the Court decides the mandate itself is unconstitutional. But, as Verrilli made clear, the government agrees with the challengers about the viability of two key regulations. These regulations would prohibit insurers from denying coverage or charging higher premiums to people with pre-existing conditions. These two concepts are known as “guaranteed issue” and “community rating.” And if the mandate goes, the government says, eventually these two provisions should go, as well. The logic here is that the mandate works in tandem with these provisions: If you’re going to stop insurers from discriminating against the sick, you have to make sure everybody gets health insurance. Otherwise, healthy people won’t buy coverage until they need it, destroying the actuarial balance that allows insurers to operate. The logic is correct. When New Jersey tried reform without a mandate, for example, healthy people fled the individual market, causing premiums to rise and, eventually, causing even more healthy people to flee. But maybe that's not the end of the story, as Farr, appointed by the court to make a different case from the government and the states, explained lucidly in his argument. The Affordable Care Act might weather the removal of those insurance regulations a little better than similar state efforts did, because the law relies on some other mechanisms for stabilizing the insurance pool. Among other things, the law’s subsidies, which are particularly generous for people making less than 250 percent of the poverty line, would attract many people who currently find insurance too expensive. It's important to put this in context: If the CBO is right, the law's expansion of insurance coverage would reach about half as many people as it might with the mandate intact. That'd be a huge difference. At the same time, premiums for the non-group market (that is, people buying coverage on their own, not through employers) would likely go up, although estimates on that vary and subsidies would offset the effect for many (maybe most) people in the market. The program would be less efficient, since the subsidy per person would be higher. And the insurance market might turn out to be more volatile, if insurers got skittish about taking on too many bad risks and started dropping out of the market. Some of the law's other mechanisms for keeping a stable insurance market, such as so-called “risk corridors,” are temporary. In other words, the best available evidence suggests that the law without a mandate would fall significantly short of the law with a mandate, both in terms of reach and stability. From a constitutional standpoint, that should be more than enough to make it “necessary and proper” to the government's (clearly constitutional) task of providing affordable coverage to all. And yet ... even without the mandate, the law would likely bring insurance to more people than have insurance today, while bolstering coverage for people who already have it. From a budget standpoint, the government might even spend less money overall, since it'd be assisting so many fewer people. (Perverse, yes, but true.) Meanwhile, the states and federal government would have opportunities to patch up the system, by re-crafting the mandate in more clearly constitutional terms or, at the very least, working on alternatives like steep penalties for late enrollment. The political will might not be there right away, but the insurance industry, undoubtedly, would be laboring to change that. Such repairs to reform could fail and, in that case, the insurance market in some states might really unravel. But at that point, either the states or the federal government could always try the solution some of us always thought best: A single, truly government-run plan like Medicare. As Justice Elena Kagan suggested at oral arguments, in this case half a loaf may well be better than no loaf at all.